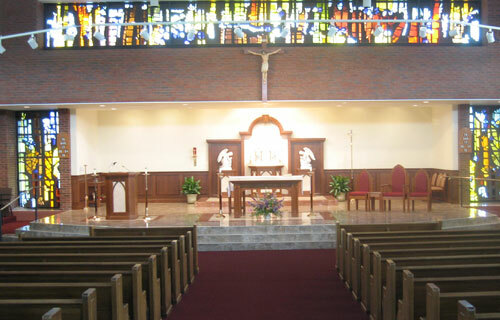 To design and remodel the entire sanctuary, including: designing and fabricating all new furnishings, artwork, marble and wood, restoration of precious Our Lady of Perpetual Help image, baptismal font, altar, pulpit, etc. Our Lady of Perpetual Help Church is like many churches which were built when there was growth throughout the Diocese, with a basic multi-purpose type room that was to be used temporarily as a devotional space until the parish could restore, renovate or build new. 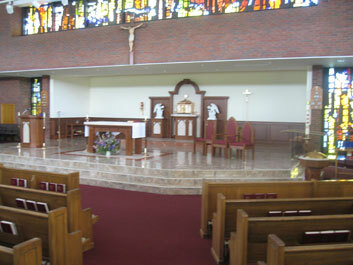 In this case, the parish needed to restore the existing space to make it a more worthy place of devotion. St. Jude Liturgical Arts Studio immediately noticed the strong, dark brick and the tones and wanted to distinguish the sanctuary and make it special and unique. Working with the Pastor and the Parish Committee, we wanted to create a devotional space, particularly an area for the Blessed Sacrament. 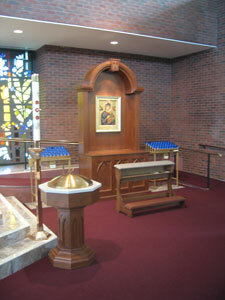 Included in the design, was setting off the sanctuary area to make it distinct and unique and unlike the rest of the building; we wanted to lighten it up and remove the dark brick; we incorporated a handicap ramp for accessibility for the handicapped; and we enhanced the beautiful Perpetual Help image. This is an image that the Redemptorist Fathers had given to the parish when they were stationed at this parish, and it is one of the icons with the Vatican seal on the back as a gift from the Vatican. St. Jude Liturgical Arts Studio, with its team of artists, restored the piece to its original beauty and enhanced the gold leaf and beautiful frame. We are also complementing its shape and designs for a framed shrine area suitable for devotions. The before and after pictures show the dark coming into the light, the excellent workmanship, and the incorporation of marble with wood, for furnishings which truly enhanced the appearance of the sanctuary. The comment from parishioners that we especially loved was that they never thought that their sanctuary could look so church-like, so beautiful, so devotional.